The debates on social media forums like Fremantle Massive seem alternate between claims of “Fremantle is dying” to that it is changing and developing too quickly. The truth is, as always, between these two extremes but I thought it worth putting some data and context around the last decade of development in Fremantle. It is no secret that in the the last decade the Fremantle Council has explicitly focused on attracting more people back into Fremantle to live, work and play. Amendment 38 and 49 (the two big ones in the east end and city centre respectively) enabled development certainty and buildings above 3 or 4 floors for the first time. After a major community debate these were finally gazetted by the WA Planning Minister in 2011 and late 2012 respectively. Meaning for the first time Freo had sites that could enable major new developments. It’d be fair to say that our on this timing wasn’t ideal unfortunately. For a large chunk of the years following these fundamental planning changes the Australian economy and the WA economy in particular has spluttered along. As a result WA has had not only the highest unemployment rate in the nation but WA also recently had its highest unemployment rate in 17 years. The lack of jobs has seen an exodus of people from WA as people head to the East Coast looking for work resulting in declining population growth into WA. Obviously a further flow on implication of this has been reduced demand for housing resulting in declining house prices. I always love Alan Kohler’s graphs on the ABC News finance report and they shows this starkly (apologies for the image quality). Perth (circled) went from having the most expensive house prices in WA in 2007 to the cheapest in 2019! Not great for economic confidence. This has impacted on getting new apartment developments under construction and with it more people moving into the centre of Fremantle. Pleasingly we have still seen some substantial developments completed in this time from Heirloom to Liv to Knutsford but undoubtedly others would have been under construction more quickly if macro-economic conditions hadn’t been so challenging. Australian retail sales edged up just 0.1 per cent in January, a much weaker result than expected. Market economists had expected a rise of 0.4 per cent, if for no other reason than January’s figures were coming off a very poor result in December, where sales fell by 0.4 per cent. But as they often say that it is all about timing and while some more favourable economic winds would have helped Freo these past few years I am nevertheless proud of the investment underway. I am even more proud though that Fremantle has the fundamentals in place to ride the next wave of investment. This will bring people back into Freo to live, work and play in a way we haven’t seen for many decades. Kings Square will be completed in 2020 and 1500 state government workers will move into Fremantle this time next year. As economic activity and population growth in WA picks up as predicted in the next few years I really do believe that Freo’s future is bright. It will feature four different offerings on the one site – with a restaurant, multi-level beer garden including a rooftop deck, basement cocktail bar and a casual front bar. 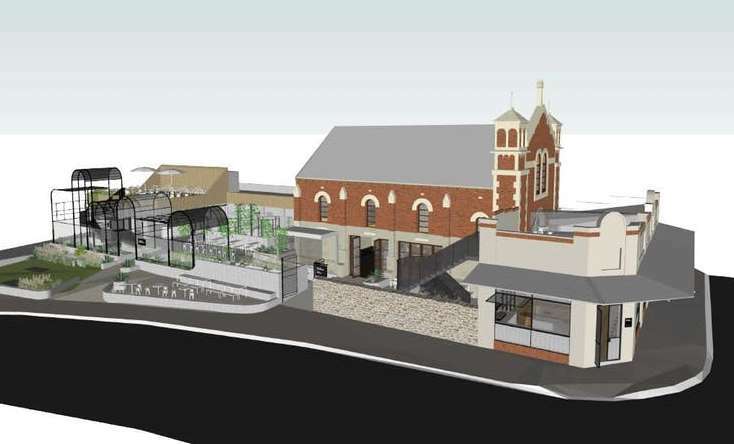 The Synagogue proposal is another example of the adaptive re-use of heritage buildings in Fremantle. It’s great to see so many developments underway in Fremantle that are not only preserving the wonderful heritage buildings we’re famous for but also putting them to good use and giving people the chance to enjoy them. In addition to the Synagogue proposal, work has started on the restoration of the Manning Buildings to create new office space in the vacant upper floors and also inject some vitality into Paddy Troy Mall with a new brewhouse and restaurant. Freo.Social in the Old Drill Hall will be opening soon as a brilliant new music venue, the old Police Station and Courthouse is being transformed into a hotel and so are the Warders Cottages next to the Fremantle Markets. The old Synagogue is in a very prominent location in Fremantle but has been vacant for a number of decades, so it’s exciting to know something will finally be happening with that site. It’s another sign of confidence in the city’s future and the private sector’s willingness to invest in Fremantle. Fremantle has rightly debated and argued for better designed density for quite some time, so I was pleased to see the release of the long awaited Design WA guidelines this week. Density done well is going to be central to a more liveable and sustainable WA and this is a great first step. Fremantle Council has selected Pindan Constructions Pty Ltd as the preferred contractor to build the City of Fremantle’s new civic, administration and library building in Kings Square, Fremantle. The new building, designed by the world-renowned Kerry Hill Architects, is a key component of the broader $270m Kings Square Renewal project – a joint initiative between the City and Sirona Capital. I’m delighted we’ve taken the next step forward in this very important project for Fremantle. We will now be in discussion with Pindan to agree on terms and look forward to progressing these negotiations. Over the next month we will go through the process of ensuring maximum value for the Fremantle community before finalising the contract and the construction timeline. Pindan was one of six shortlisted companies selected to tender for the once-in-a-generation construction project, a key component of the broader Kings Square Renewal project, which began in 2017. The renewal of Kings Square will transform the Fremantle city centre and this new building will be the centrepiece of that from a civic and community point of view – I expect the new building will become the heritage of the future. A further announcement will be made once a final contract is awarded. Following a multi-million dollar upgrade over the past seven months, the privately-owned Kings Square car park (formerly known as Queensgate) will partially re-open on Wednesday 31 October. There will initially be around 470 bays available, with more bays coming on line as work is completed. Good to have it open in time for the busy Christmas trading period. The broader Kings Square Renewal project is progressing well and having the car park back in operation is another major milestone. We’re pleased Sirona and their builder Probuild have honoured a commitment made earlier this year to have the car park back up and running by November. The upgrades include structural works, protective epoxy coatings to decks, new paint and line markings, new lighting and services throughout. The new lift and stairwell is expected to be completed in a few more months with the original lift and stairwell available until then. Parking costs have been set at $3 per hour with a $9.00 early bird all day parking rate available. As an opening special, car park owner Sirona Capital have announced there will be free parking between 6am to 7pm up to an including Sunday 4 November. Copenhagen is repeatedly named as one of the most sustainable, livable, and happiest cities on the planet. Synonymous with beautiful architecture and a paragon of people-oriented urban design, professionals shaping Copenhagen are in high demand across the globe. From elegant harborside architecture to prioritizing bicycles over cars, Copenhagen offers pragmatic—yet chic—solutions to 21st century urban challenges. Here are three Copenhagen-related principles to inspire architects and urban designers around the world. In the 1960s, dense traffic, parking lots, and dominating tower blocks began to replace Copenhagen’s traditional residential blocks and narrow streets. Its architects and urban designers found themselves at a crossroads: Would they continue to raze neighborhoods and pour concrete in the name of urban progression, or would they maintain the city’s traditional citizen-focused design? The city’s urban designers halted their 1960s push toward dense, concrete towers in favor of maintaining a more human scale. Much of the city is oriented toward the waterfront, encouraging recreation. The city’s U-turn from a more aggressive approach to urbanism was not a mistake but rather a conscious and collective effort to ensure the city was built at a citizen level. “Copenhagen is a human experience at every turn,” where the “cross-pollination between engineers, urban planners, and designers and architects ensures a common vision and goal,” says Colville-Andersen. When Bjarke Ingels and his firm BIG were commissioned to design Copenhagen’s new waste-to-energy plant, they were determined to dream up a way to transform the negative stereotype of a power plant into a positive. The logic was simple: Why not make use of what will be a giant incinerator by also turning it into a ski slope? After all, Denmark gets cold but has no mountains. Set for completion in autumn of this year, Amager Bakke (or “Copenhill,” as it has become known to locals), is set to be the world’s first plant of its kind, while also doubling as a leisure destination in its own right. The thinking is simple yet brilliant. Just a bicycle trip from Copenhill are a number of Ingels’ projects applying this very principle: Islands Brygge brings the beach to the heart of the city; 8 House combines retail, offices, houses, and apartments into a single building with a promenade and cycle track; and the Mountain Dwellings turns a car park into a housing project—complete with beautiful garden rooftops and a climbing wall thrown in for good measure. All of this sounds like science fiction, but it’s the world-changing potential of architecture. Today, Danish design is marked by a robust command of symmetry mixed with a degree of playfulness. While many of today’s architects of notoriety have gained recognition using a signature touch (think of Zaha Hadid’s undulating curves and Frank Gehry’s sweeping, metallic surfaces), Copenhagen is built upon an experimentation of new ideas unique to their context. “The city has become a 1:1 laboratory of our work in all scales. In its very nature, any piece of realized architecture represents a serious use of resources. We believe in exchanging these resources into increased livability for people,” says Stubbergaard. The newer buildings that compose Copenhagen’s skyline often push the envelope of traditional design, creating an interesting juxtaposition with the city’s preserved historic façades. A robust command of symmetry mixed with a degree of playfulness helped bring 20th century Danish architecture to an international audience (Jørn Utzon’s Sydney Opera House, for example). Such virtuoso experimentation continues to influence the design of Copenhagen today. The not greatly loved 1960s built City of Fremantle administration and library building in Kings Square will be completely gone in a matter of weeks. The building was assessed as being asbestos-free last month, following a four month asbestos removal program to prepare it for the final demolition phase. This final phase will see the building demolished with the majority of the structure recycled. The site will then be prepared for the construction of a modern, competition-winning new civic, administration and library building as part of the broader Kings Square Renewal project. Demolition activities are currently focusing on the delicate separation of the building from the Fremantle Town Hall, some of it done by hand to protect the heritage-listed building. Pleasingly it has gone well and the original limestone wall of the Fremantle Town Hall are now visible for the first time in decades and will be a feature in the new civic building.